Beautiful newly renovated penthouse with a terrace of 30 m2 with direct access from the living room. A cozy space with three separate rooms and work area. The center is 10'en bus stop at the Pza. Del Pilar, 20'caminando, or 10' Bike Urbana. Free parking, in a quiet and safe neighborhood, where you can leave your car. Prepared food store, supermarket and services, including a health center. You'll love my attic newly renovated with a terrace of 30 square meters, with direct access from the living room, in a quiet area, where you will be able to relax, dining in after visiting the city terrace or breakfast quietly before out. A cozy space with three bedrooms and a work area in one of them, so you can have your independence if you are traveling with children or friends. Store prepared food doorstep (if you do not feel like cooking after visits). Large supermarkets 1 minute (Lid'l, simply, mercadona, day) and service shops of all kinds, including health center and specialties. We are ready to facilitate your stay, travel and bus stops, tourist information leaflets in the city. You'll find the house, like yours, with everything you need for your stay. Large spaces nearby, fully free parking (without pay areas), in quiet and safe neighborhood where you can leave your car if you're traveling with him, without having to use it to go downtown. Store food prepared at the door (if you do not feel like cooking after visits) 1 minute large supermarkets and service shops of all kinds, including Health Medical Center. Attractions: Public transportation, direct, without transshipment, stopping at the Plaza del Pilar and the tourist bus stop in 10 minutes..
Night transport (Line 1) from 1 to 6 A: M on Saturdays and holidays direct stop without transhipment. Bicycle Rental Zaragoza city hall a minute. The city center is a 10-minute bus tour and a 20 minute walk. fully equipped kitchen with dishwasher, microwave, oven, fire and large fridge. In the bathroom, we provide, soap, gel, toilet paper, hair dryer and towels. Outdoorsman, travel and the people around me, I am familiar, close and passionate enjoy and take advantage of the day. Enchanted to teach and advise the wonders of our land are many and varied, eager to welcome you to my house, that will be your home during your stay in Zaragoza. You'll love my attic newly renovated with a terrace of 30 square meters, with direct access from the living room, in a quiet area, where you will be able to relax, dining in after visiting the city terrace or breakfast quietly before out. A cozy space with three bedrooms and a work area in one of them, so you can have your independence if you are traveling with children or friends. Roomy apartment with useful roof terrace. 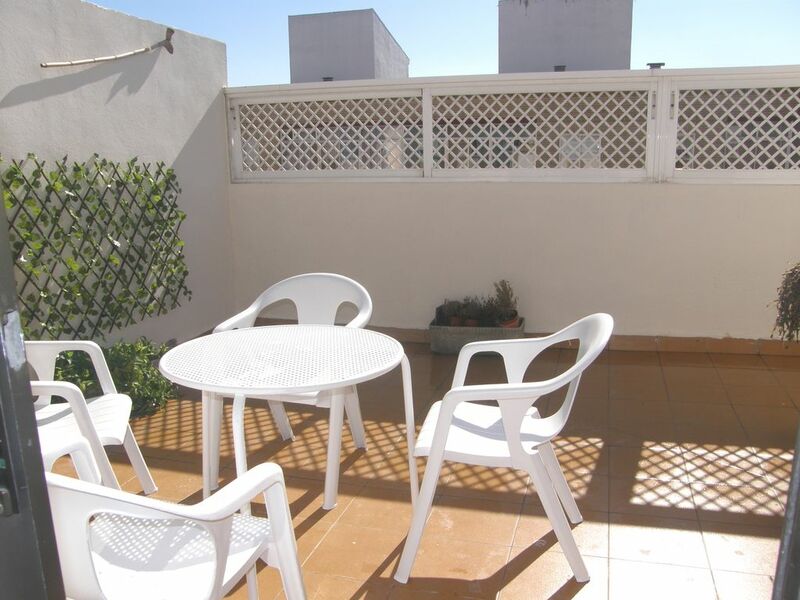 A comfortable apartment about 25 mins walk from the centre of a very interesting town. Good bus service too. Communication with our host Antolin was through email and arrival details only reached us on our start day; would have preferred them earlier. Appartement très fonctionnel, super bien équipé avec une magnifique terrasse. Quartier super calme avec tous les commerces a proximité (boulangerie, vente de fruit et légume, café et supermarché) et à environ 3 kilomètres du centre historique. Aucun problèmes pour se garer nous avons toujours trouve une place (gratuite) a proximité de l'appartement. Nous recommandons cet appartement pour visiter Saragosse et sa région. Sehr freundliche und hilfsbereite Gastgeber. Saubere gepflegte Wohnung. Die Ferienwohnung liegt weit oben über den Straßen von einem Zaragossa. Zur Altstadt sind es 25 Minuten zu Fuß. Einkaufsmöglichkeit 5 Minuten zu Fuß.